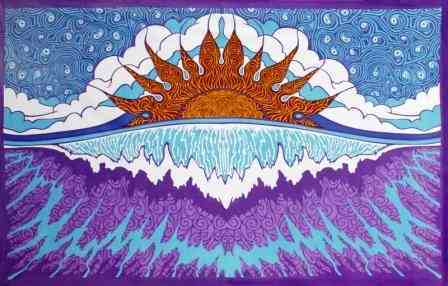 The sound of the waves and the sight of the sun coming down are what this Sunset Wave tapestry represents. The blues, purples and gold on this tapestry are meant to remind you of the last intense sunset you saw at the beach, and the magic you felt in that moment. This large tapestry is approx. 60" x 90" . You can use this tapestry as wall hanging in your home or office, throw it over a couch, or as a bedspread on a twin bed. It would also look great in a dorm room. It is equipped with specially-designed loops to accommodate easy support from a wall, window frame, or ceiling.